[November 09, 2013] Judgment is the essence of leadership. The ability of first-class leaders to make good judgments and the cumulative impact of those judgments will determine the quality, effectiveness, and success of the leaders’ organizations. The exercise of good judgment in the workplace is the special quality sought in leaders of all kinds. In particular, this is critical for senior executive leaders since their judgments are important to the organization and those people connected to decisions derived from them. The quality of those judgments themselves is based on the context of the leader’s relevant experiences, social connections, organizational methods, and the business environment. In short, the leader will have biases that influence judgment. Because the leader is influenced by biases, the possession of moral courage and character should be emphasized. Taking responsibility, knowing right from wrong, developing trust and confidence, and decision-making for the good of others is an essential for that leader. The integrity of the leader cannot be overstated. Important for senior leaders is also knowing when and what judgments must be made. Leaders are capable of making decisions in many situations, but they should be circumspect about them. Leaders are taught to make timely decisions. Timely however does not mean immediate. Waiting may be the right thing to do. By waiting, more information can be gathered, conditions can change, or even the need for a decision may go away. Patience, knowing when to make a judgment, is another positive quality of the senior leader. Some judgments are easy to make. 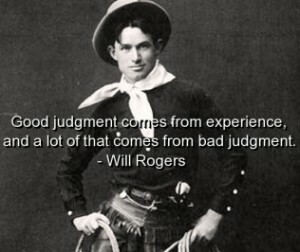 Senior leaders should make only those judgments relevant for their level of authority. Easy ones can be made by junior leaders; it gives them the opportunity to be decisive, gain experience, and show their value. The best senior leaders make judgments only on those things they must make a decision, nothing more or less. Long-term success of making the right judgment calls is the personification of the best leaders. Only those with the right experience and moral character can make the right judgments. Noel M. Tichy and Warren G. Bennis. Judgment: How Winning Leaders Make Great Calls. Penguin Group (USA) Inc., New York, New York. 2007.